All applicants must provide contact information, upload three (3) digital high resolution jpeg images of plein air work painted in the past two years and pay a $50 registration fee. All applications must be submitted online by January 25, 2019 at 5:00pm EST. Any questions or concerns should be directed to Plein Air Easton staff at 410-822-7297 or info@pleinaireaston.com. In its 15th year, Plein Air Easton is the largest and most prestigious outdoor painting competition in the United States. The festival is the work of the Avalon Foundation, a non-profit organization whose mission is to enrich the community through music, arts and community outreach programming. The object of PAE is to expose the area’s vibrant arts community to a larger market and to raise funds to support the festival and the Foundation. Artists are juried into the festival from hundreds of worldwide applicants. The artists selected for the competition make up some of the best plein air painters in the country. They travel to Easton, Maryland and paint for six days competing for over $30,000 in prizes. Competition paintings produced during the week are exhibited in a local accredited museum and sold throughout the weekend. Celebrating its fifth year is the improved space for display of non-competition works, which provides additional opportunities for the public to view and purchase all work produced during the festival. In 2018, sales exceeded $400,000. The entire community mobilizes in celebration of this event. PAE and its community partners produce many events throughout the week including workshops, demonstrations, concerts and ticketed events. This year’s festival dates are July 12-21, 2019. To allow artists to get settled and participate in pre-festival paint-outs, host family housing will be open for artists beginning on Wednesday, July 10, 2019. Artist Registration, Orientation and Canvas Stamping will take place July 12th. PAE will host a Meet the Artist Dinner and Paint Out for the competing artists, the organization’s top collectors and donors on July 13th. Public facing events begin in earnest from July 14 – 21st. Plein Air Easton enjoys the highest art sales of any Plein Air event in the United States. It is a juried competition with a new juror and judge each year. Any artist who paints en plein air may apply. With only the top award winners receiving automatic entry into the competition, the festival tends to see 1/3 to 1/2 of its population as new artists each year. Plein Air Easton represents a meaningful opportunity for emerging artists to gain national recognition. PleinAir Magazine called PAE “one of the most rewarding outdoor Arts Festivals in the USA.” With a reputation for strong organization, growing sales, a beautiful landscape and just plain fun; PAE has become a “must paint” for many of the world’s top painters. What should I expect if I get in? You should expect to visit a beautiful waterfront community full of welcoming people. You should expect an event that is well organized and values artists. You should expect fierce competition from top plein air artists. You should expect lavish parties and opportunities to connect with collectors. You should plan on making friends and establishing contacts. You should expect it to be hot - very hot and humid. You should expect to have fun and leave tired. You should expect to want to return the next year! I live locally what is different for me? Plein Air Easton has always sought to elevate and highlight the local arts community. If your primary residence is in any of the five counties surrounding Easton, MD (Kent, Queen Anne, Talbot, Caroline or Dorchester), please indicate so on your registration form. After the juror chooses the 2019 slate (based on the images submitted by all applicants, including those that live locally), he/she will be presented with the images submitted by the “local” artists, of which he/she will choose three additional artists to participate in the Festival. This will give local artists two chances to be juried into PAE. PAE does not reveal which Artists are juried into the festival through this local-only process. January 25, 2019, 5:00pm EST – All entries must be received. 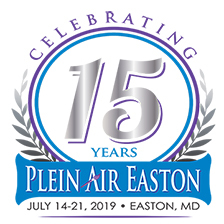 February 8, 2019 –2019 Plein Air Easton competition artists will be posted online at www.pleinaireaston.com and all competing artists will be notified via email. July 19, 2019 – Mandatory attendance at the Collectors’ Preview Party located in the Academy Art Museum & Waterfowl Festival Building. The event opens to ticketed collectors at 7pm. July 20-21, 2019 – Exhibit and sales continue workshops, lectures, quick draw competitions and more! July 21, 2019 – Small Painting Sunday and Judge’s Talk. All unsold paintings must be collected by artists at 4pm on July 21. How is Plein Air Easton Juried/Judged? Plein Air Easton names a new juror and judge each year. The juror views three digital images from each artist online, so be sure to give us files that will present well on a computer monitor. The juror sees no identifying information about the artists. The juror submits a list of numbers to the Festival’s executive team who convert the numbers back to names and announce the list of competition artists. All competition paintings are eligible to win prizes that are awarded by the competition judge at the Collectors’ Preview Party. Who are this year’s Judge and Juror? The son of artists Edgar Levy and Lucille Corcos and godson of sculptors David Smith and Dorothy Dehner, David Levy grew up in the midst of the creative community that moved the world’s art capital from Europe to New York during the seminal years of the late 1940s and early ‘50s. An internationally known and highly respected arts professional, he is an artist/designer, educator, museum director, art historian and musician. Mr. Levy served for 19 years as the CEO of the Parsons School of Design, transforming the school from a small, struggling, non-degree-granting trade school into one of the largest and most diversified visual arts colleges in the United States. He served as President and Director of the Corcoran Gallery of Art and College of Art and Design. Over his 14-year tenure, Levy rebuilt both the museum and its college of art, mounting more than 300 exhibitions and expanding the museum’s 1990 attendance of 80,000 to just under one million by 2004. In 2005, Levy began a consulting relationship with Cambridge Information Group (CIG) and, in 2007, became President of its Education Group and of its graduate school, Sotheby’s Institute of Art. Other accomplishments include the creation of The New School of Jazz and Contemporary Music, co-founding the Delaware College of Art & Design and Bach to Rock, a chain of music schools with an innovative curriculum based on the formation of small bands. Awards will total over $30,000 and typically include 16-20 awards for competing painters. If I get in to the Competition, what else should I consider? Taking advantage of host family housing as a great way to reduce travel costs and get to know this community. Participating in Pre-festival paint outs, July 11-12, in order to create enough inventory for sale, meet collectors and become familiar with the area. Attending Orientation on July 12th in order to get briefed on the comprehensive rules and get canvases stamped. Enjoying the Meet the Artists Dinner and Paint Out, on July 13th, to meet collectors & donors as well as enjoy the rich landscape of the Eastern Shore. Providing up to eight additional plein air paintings from home or that are produced during the week for exhibit and sale.